Plot: Sixteen-year-old Bobby tells his story in an unconventional way. Sections are titled either “then” or “now,” to show how he simultaneously copes with his challenging reality and reflects on the events that led him to his current situation. And Bobby’s situation is a tough one indeed: he is raising his infant daughter alone. 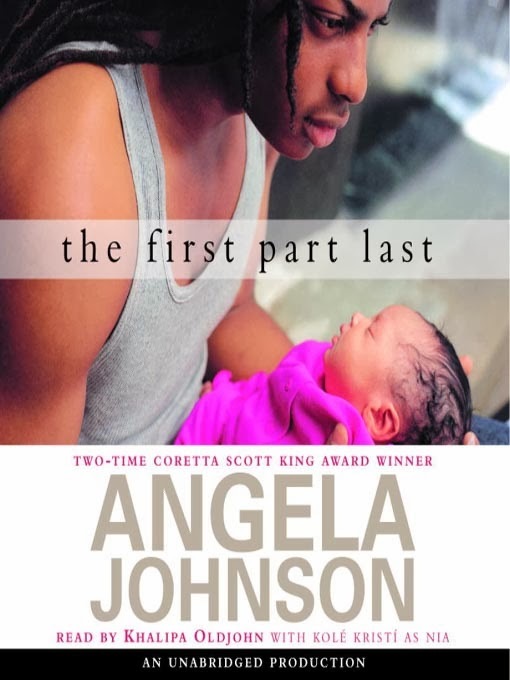 Bobby’s memories of learning that his girlfriend Nia was pregnant, being advised by everyone to put the baby up for adoption, and trying to wrap his head around the idea of a baby are interspersed with his new reality of caring for baby Feather. His parents, loving but disgusted with his choices, have made it clear that it is up to him to take care of the baby, and he struggles to finish high school while coordinating her care. A twist near the end reveals why Nia is no longer a part of his life (we won’t give it away), and the book ends as Bobby finally gains a sense of clarity about his new role. Adult Themes: Surprisingly few, given that this is a book about teen pregnancy and parenthood. Occasionally there is language that some may find objectionable, however. Our Take: Few novels for young people explore the realities of teen parenthood, and fewer still do so from the perspective of a teen father. This theme coupled with The First Part Last’s unconventional layout makes this novel an unforgettable book. Johnson’s writing style is simple and poetic. Most characters are well developed, and she is able to convey a visceral sense of Bobby’s fatigue and confusion, but also of his wonder at his daughter and the aching love he feels for her. And don’t worry – Bobby is in awe of little Feather alright, but The First Part Last in no way glorifies teen parenting. Bobby’s confusion, heartache, isolation, and exhaustion ring loud and clear from virtually every page of this book. While we think The First Part Last would be a great book for any adolescent, it’s a particularly good choice for at-risk readers for several reasons. For one, the story itself is compelling and the characters are relatable. Also, the text is arranged in short paragraphs and even individual sentences that form their own paragraphs, so the pages are appealingly sparse; there are no intimidating dense blocks of text here. While the reading feels accessible, some readers may need a bit of support while they get used to the interspersed plot lines. We highly recommend this book. Its simplicity allows even struggling students to get through it, and its complexity ensures that the story will stick with them long after they finish it.